Home / Automotive / Cars / Hero Biker Stops A Taxi From Driving On The Wrong Side Of The Road! 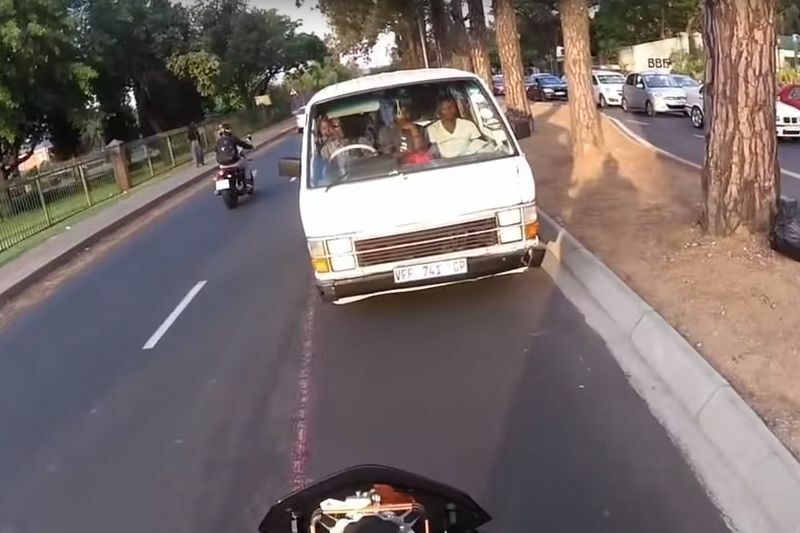 A South African taxi driving on the wrong side of the road during peak-hour traffic has just been “schooled” by a concerned citizen on a motorbike. There seems to be a new wave of social activists in South Africa who are banding together to stop petty crime in its tracks. SA motorists are clearly getting fed up with taxi drivers putting motorists' lives at risk by their driving style. It has become a habit for taxi drivers in SA to drive into oncoming traffic if lanes are moving slowly during peak hour drive times, but it is obviously illegal! Sean Nysschen, a road user in Johannesburg, saw a Taxi driving on the wrong side of the road in Bryanston and decided to stop him from putting the lives of the passengers and other road users in danger. The biker, frustrated with some people breaking the law and getting away with it, stopped him and was eventually joined by other concerned South Africans who eventually forced the taxi to completely reverse and join the rest of the traffic. One woman in a silver VW would not allow him to pass and pointed out to the taxi driver that he was not allowed to drive on the wrong side of the road. Metro Police spokesperson, Chief Superintendent Wayne Minnaar, has said that “driving on the wrong side of the road is a contravention of the National Road Traffic Act” and worth a R1,000 fine but for some reason, taxi still takes a chance when roads are at the busiest. The video which has been shared thousands of times has struck a chord with South Africans who are frustrated with crime and lawlessness in our country.